Zanu-PF Mashonaland West provincial chair and Hurungwe West legislator Cde Temba Mliswa yesterday said the ruling party’s secretary for administration and Minister of State in the Office of the President, Cde Didymus Mutasa, facilitated an out-of-court settlement for him in a US$165 million plus dispute with Mr Conrad “Billy” Rautenbach. The dispute stemmed from money Cde Mliswa said he was owed for facilitating Mr Rautenbach’s interests in Hwange Colliery, Unki Platinum Mine and the Chisumbanje ethanol plant. Cde Mliswa said some of the deals guaranteed him shareholding in the projects. On Sunday, Cde Mutasa denied playing any role in the Mliswa-Rautenbach wrangle. At a Press conference in Harare yesterday, Cde Mliswa reiterated that Arda board chair and former Zanu-PF Manicaland provincial chairperson Cde Basil Nyabadza — and other unnamed politicians — were in the deals. He claimed Mr Rautenbach bought Cde Nyabadza a house in Mutare and gave “brown envelopes” to several politicians whose names he said he would soon reveal to oil his deals claiming Mr Rautenbach, who he described as Zimbabwe’s biggest land owner, owned the Government. Cde Nyabadza yesterday said he was contemplating legal action against Cde Mliswa over the allegation. Cde Mliswa said his multi-million-dollar deals with Mr Rautenbach were entirely verbal and there was no paperwork to confirm them. The politician demanded at least US$165 million from Mr Rautenbach as facilitation fees and shareholding in the three projects after linking him to several senior politicians pursuant to landing the contracts. Cde Mliswa alleged that Mr Rautenbach got platinum claims worth over US$4 billion for free from Government at Unki and fraudulently sold them for US$1 billion, none of which benefited the country. He said he was owed 10 percent of that sum, translating to US$100 million, for his verbally-agreed shareholding in the Unki platinum concession. On Hwange, Cde Mliswa said he was to be paid US$10 per tonne of coal and US$5 for every tonne of coke supplied to Hwange Thermal Power Station. Cde Mliswa yesterday also said Mr Rautenbach was the biggest land owner in Zimbabwe with over 2 000 square kilometres in Nuanetsi, 30 000ha in Chisumbanje, and 30 percent of Anglo-American platinum concessions. “Billy claims to own the entire Government. No wonder the ministers are dilly-dallying at the end of the day (in bringing him to book) … All these transactions happened in front of people. People of repute, and when I am sitting with national leaders and we agree, I consider the deal signed and sealed. “But yes, we have a problem with politicians who are hungry who then circumvent you so that they can gross too,” Cde Mliswa said. “It is also a normal business practice, whether it is normal business practice I do not know but in Zimbabwe we would call it normal business practice, where you take somebody to a leader but the next thing that leader is circumventing you and is dealing with that. Cde Mliswa insisted that his business transactions with Mr Rautenbach were above board and explained the role Cde Mutasa played in the whole saga. “It is a normal business practice to demand a share of the cake if you are involved. There is nothing amiss about that and since 2011 we then withdrew the transactions on the basis that the Minister of Presidential Affairs Honourable Cde Mutasa came to me and said Billy had approached him for us to settle this out of court. “The onus is on you (journalists) to go and ask the Honourable Minister ‘did Billy ask you to settle this out of court?’ Because he is an Honourable MP and he so happens to be my uncle, I trusted my uncle. I decided that the matter be settled out of court because he had gone and asked him to do that. “Basil Nyabadza was there. I am the one who took Billy to Arda. Basil Nyabadza never knew Billy. Why was I in a flight from Harare to Arda? Certainly I was not a flight attendant. It is a helicopter, a helicopter does not need a flight attendant. So what was I doing? “It would be good for him (Billy) to answer what I was doing on that flight,” he said. “I told you the role that Mutasa played in us wanting to go to Chisumbanje. He is a leader in Manicaland. It is no secret. You, munosvika kumusha kwababa moti tichada kupinda ne investment iyi. “I had applied for this (Chisumbanje). I did not have money. I then incorporated Billy. Billy was interested in Arda Sisi. I told him Arda Sisi is too small why don’t you go to Chisumbanje? Cde Mliswa said as a director in the companies he was entitled to allowances. “I do not come cheap. I am not one of those who get satisfied about being given a brown envelope and go. I want a stake in the business, especially if it is a lucrative business,” he said. Cde Mliswa also explained the role Zanu-PF Politburo member and former Hwange chairman Cde Tendai Savanhu played in the deals. “I approached Government and Honourable Savanhu was the chairman of Hwange. We wanted to do business with Hwange. What was wrong with approaching a chairman of a company? “It was then left to the CEO Fred Moyo to deal with it. Again, that transaction did not come out the way it was supposed to come out,” he alleged. Cde Mliswa said Mr Rautenbach got a Hwange coal claim after pledging to Government to improve power generation by supplying coking coal. However, Cde Mliswa said, Mr Rautenbach exported the coal even as Zimbabwe battled electricity shortages. He further accused Mr Rautenbach of exporting four million litres of ethanol from Chisumbanje, as reported by The Herald yesterday. This, he said, caused panic because of the mandatory blending policy, forcing Government to turn to Triangle for ethanol supplies. On Cde Nyabadza, Cde Mliswa said: “Basil Nyabadza benefited with a house in Mutare. You can call him and ask where he got the house from. His companies are not doing well. Billy Rautenbach bought a house for him, no wonder he has become a spokesperson for Billy when you talk about Green Fuel. He accused Cde Nyabadza, whom he constantly referred to as “Uncle Tom”, of fronting white interests in Chisumbanje and the Save Conservancy. Cde Nyabadza yesterday denied the allegations and indicated he would report Cde Mliswa to the police. Cde Mliswa claimed The Herald’s detailed reports on the saga were a reflection of factional fights in Zanu-PF, and that reporters had been paid to scandalise him. He then accused Information, Media and Broadcasting Services Minister Professor Jonathan Moyo of abusing the public media to settle political scores. “There are factions in the party. I am sure the Minister of Information belongs to another faction so he will also attack another faction. 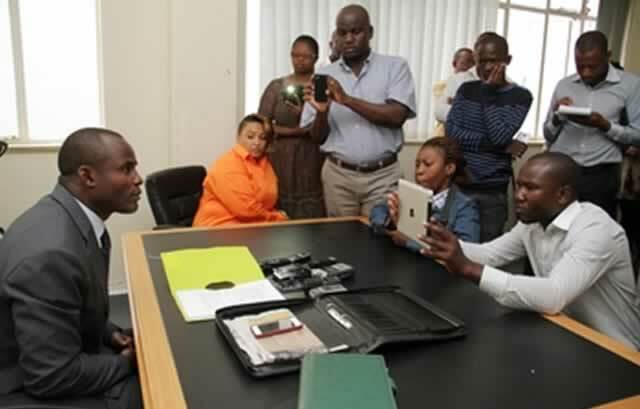 I say this boldly without fear,” Cde Mliswa said. He associated Prof Moyo with party big wig Cde Emmerson Mnangagwa. “It is not a secret that Minister Moyo was once associated in the Mnangagwa faction,” he said. Prof Moyo yesterday denied being in any faction saying since Mliswa had admitted involvement in factions he was not fit to continue holding the office of Mash West provincial chairman. “This comrade is out of order. His incoherent ranting is equivalent to that of philandering husband who when his wife notices just before they go to bed that he is wearing a woman’s underwear, he adorned by mistake after having a quickie with his small house on his way home, wonders aloud exclaiming: “who put this underwear on me?” The comrade has clearly been caught with his hands in the till and he thinks he can cover up his naked corruption by seeking refuge in what he declares to be his faction against what he imagines to be a rival faction. And the comrade’s self-indulgent claim that only the public media is uncovering corruption or that there’s a factional agenda to the coverage can only be believed by the walking dead among us. The entire media is doing a good job for which it should be commended by all well meaning Zimbabweans. ‘‘But if the comrade is still capable of sobering up I am sure he will see how wayward he has gone and he will hopefully come to his sense and get down from the money helicopter and stand firm on his feet because he is a chairman of one of our ten provinces and he needs to live up to his responsibilities within the party without throwing mud all over the place in defense of racketeering and corruption in pursuit of some US$165 million. Just because he has come out and declared that he belongs to a faction in Zanu PF does not mean we are all like him and we belong to factions. He is definitely in a class of his own as exemplified by his confirmation that he had helicopter rides for which he expected to be paid millions of US dollars. Who else out there and what faction can boast of that corrupt feat? ‘‘Otherwise everybody knows that he has been posing as a champion against corruption Parliament making all sorts of scurrilous allegations of corruption against some government ministers but nobody has accused him of speaking from the podium of a faction. So when does he see factions and conspiracies? Only when he is in the dock? But now he has let the cat out of the bag about his factionalism and he now must be told that, having openly declared that he belongs to a faction, he does not qualify to retain his position as chairman of Mashonaland West Province because factionalism is against Zanu PF’s constitution, ideology and policies,” Minister Moyo said. Mliswa did not explain why, as a responsible legislator, he had not reported Mr Rautenbach to the police but said he would raise the matter in Parliament today.